When it comes to finding the perfect truck to fill that space in your driveway, the options available can seem a bit overwhelming. Between all the different automakers, models, and body styles available, settling on the right vehicle can be a difficult task, especially if you’re shopping used. Used truck lots across the country are stocked full of semi-decent and so-so options, with only a few winners hidden in between. That’s why those drivers looking for an excellent vehicle on a quality used truck know that there’s only one way to get everything you’ll need and more: a Certified Pre-Owned Chevy. Used Chevy trucks are already some of the most impressive on the road today, featuring a wide variety of upfits and available features to deliver unparalleled power and precision on just about any terrain. But by choosing a Certified Pre-Owned Chevy, you’re choosing all that impressive automotive power and matching it with the quality guarantees that come directly from Chevy. Not only do Certified Pre-Owned Chevy trucks offer peace of mind and a security that the truck you’re buying is in great condition, but they also set a standard for what every other used truck could – and should – be. Whether you’re an experienced Chevy driver with a long history buying the brand or a newly-licensed driver looking for a safe, reliable truck that can go the extra mile, there’s simply nothing that can quite compare to a Certified Pre-Owned Chevy. Just take one look at everything these impressive vehicles bring to the table and you’ll see how few models on the market today can really compare. One of the biggest unknowns when it comes to purchasing any used vehicle is its prior history, including everything from previous accidents to major repairs and even the number of owners it’s had in the past. For the average used truck, this information is often not readily available, and many of these hidden issues come to the surface only when a problem arises. This can be enough to scare come customers from even purchasing used in the first place, and that means higher costs and fewer options for buyers who would prefer to avoid buying new. With a Certified Pre-Owned Chevy truck, you get all the security and, often, warranties that come with an officially inspected and certified vehicle. Every Certified Chevy is thoroughly looked over and checked for any deficiencies by a licensed, Chevy-certified mechanic. These mechanics run down a comprehensive list of repairs and basic checkpoints to ensure your used Chevy operates at basic quality standards before it ever hits the lot. That means each and every Certified Pre-Owned Chevy truck you test drive is backed by a professional inspection and all necessary repairs to make it operate almost as though it were fresh from the assembly line. And since all of this information is meticulously recorded, you’ll have a thorough list of any issues the truck may have had prior to repairs and any repairs that should be on your radar in the miles ahead. Plus, the after-market warranties included in nearly every Chevy Pre-Owned Certification means you’re protected from any unexpected repair costs even well after you’ve left the lot in your Certified Pre-Owned Chevy. Built to be more than just a basic work truck, but controlled and precise enough for any tough job you may need to tackle, Chevy trucks are some of the most versatile and reliable vehicles on the road today. Off-road, on-road, worksite, or mud pit – wherever you may find yourself, your Certified Pre-Owned Chevy truck is ready and able to get you home in one piece with no issue. Maybe you’re looking for a Chevy that can conquer the toughest jobs on your work site, able to haul whatever gear or equipment you may need to bring along. For this heavy lifting, drivers may want to consider a quality power-packed used Chevy like the 2015 Chevy Silverado 3500HD. Ruggedly styled and packing enough power to pound over any surface, the 2015 Silverado 3500HD features your choice of a 6.0-liter V8 gasoline engine, capable of an amazing 360 horsepower and 397 lb-ft of torque, or the legendary 6.6-liter Duramax turbodiesel V8, capable of 380 horsepower and a truly crazy 765 lb-ft of torque. In this Chevy, your toughest tasks are a piece of cake – and it all comes with the guarantee of a Certified Pre-Owned Chevy. Or, for those more into the off-road life, the 2015 Silverado 2500HD LTZ features some of the most impressive off-road trucking found in a used pickup today. Boasting a 7.2 second 0-60 mph time, the 2015 Silverado 2500HD is no slouch when it comes to pounding over the pavement in no time flat. Plus, with off-road ready features like Rancho shocks with LTZ suspension, crossing chasms and taking on rocky trails is easier than it’s ever been before. Sometimes, staying on the roads just isn’t in the cards – and why not enjoy the great outdoors in a reliable, affordable Chevy truck? Regardless of year, model, power rating, or any other variable, Chevy trucks are no joke – and when you choose a Certified Pre-Owned Chevy truck, that becomes immediately apparent regardless of which truck you choose. That’s because every Chevy comes packed with decades of high-quality automotive engineering, with refinements and improvements that only quality American-made vehicles feature. Add in the guarantee of a Chevy-Certified mechanic and you’ve got a lineup of used pickups that you can safely trust in just about any situation. Thanks to the easy buying process afforded by Certified Pre-Owned Chevy trucks, getting your hands on a great used pickup is now easier than ever – making the hardest choice simply which Chevy you’ll choose for your driveway. Whichever Chevy you pick, you’re sure to find plenty of reliable power and style packed into each and everyone. 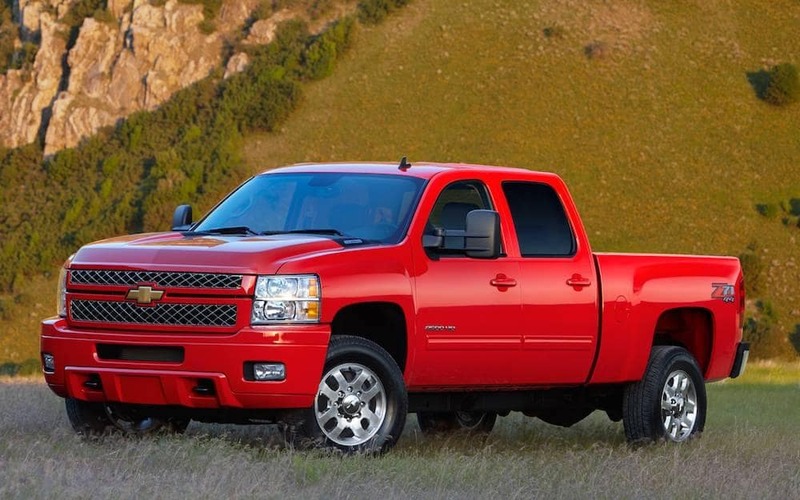 Check out a Certified Pre-Owned Chevy truck for yourself, and see why that iconic bowtie brand still makes some of the most exciting trucks on the road today.